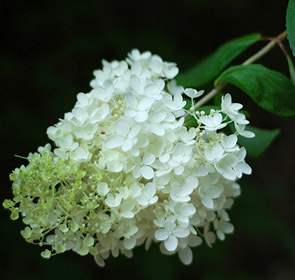 The bloom period of a peegee hydrangea is especially long, beginning in mid summer and lasting until late autumn. The color of blooms on a peegee hydrangea changes during the bloom period. Beginning as a white, the blooms age to pink and finally turn a rusty brown in autumn. Unlike some other hydrangeas, peegee hydrangea blooms do not change with the pH level of the soil. These hydrandeas are grown in tree form and shipped with stakes to be used for the first year or so. These are shipped in containers with soilless media and a 9 month slow release fertilizer.